The homebuilder's new order numbers suggest this recent revenue decline won't be the last one. Check out the latest KB Home earnings call transcript. For reasons that are hard to understand, homebuilder KB Home (NYSE:KBH) is a bit of a Wall Street darling. Analysts upgraded the stock seven times in 2018 and are expecting considerable growth in 2019. Based on its most recent earnings report, though, meeting those expectations is going to be a challenge. In fact, it wouldn't be surprising if we see earnings at KB Home decline in 2019. Here's a look at why KB Home's results are looking a little shaky right now and why 2019 could be a challenging year. DATA SOURCE: KB HOME EARNINGS RELEASE. EPS = EARNINGS PER SHARE. Thanks to the recent round of tax cuts, KB Home was able to post a decent increase in earnings per share. Were it not for those changes, though, this past quarter would have been a bit more disappointing. Revenue decreased 5%, net new orders declined 12%, its cancellation rate increased to 28%, and its community absorption rate -- the number of homes sold per community -- was down to 2.9 per month. On their own, the raw numbers don't paint a pretty picture, but it gets worse when you drill down into the regional results. The West Coast market has been its largest and most profitable region, but this is where KB Home saw some of its larger declines. Even its uptick in sales in the Southeast couldn't make up for the West Coast decline. What's worse is that net new orders for the West Coast were also down 20% this past quarter to 485. Losing that much business in the West Coast led to its backlog shrinking. Yes, homebuilding is a seasonal business, and this time of the year is typically the lower season, but declines this sharp are more than just seasonal trends and portend weaker earnings results in the coming quarters. If there is one thing to give KG Home credit for, it's that management is starting to tackle its debt load. The company reduced its total debt load by $260 million in 2018 and was able to get net debt to capital down to 41%. Even with these improvements, though, it still remains one of the most indebted homebuilders out there. The largest headwind for homebuilders today is housing affordability. After years of increasing home prices and the recent uptick in lending rates, potential home buyers are starting to balk at the price for a home. According to CEO Jeff Metzger, the company is looking to address this in 2019 by making some tweaks to the homes it's currently offering. We believe we are well positioned for 2019, with an anticipated 10% to 15% increase in our community count. In addition, we have taken proactive steps to reposition many of our existing and future communities to make our product more affordable. Our business model enables us to efficiently move with demand, leveraging our existing plan series to add smaller square footage options to our communities, and adjusting the specification levels within our homes. The specification level is a big thing for KB Home because it prides itself on the level of customization it provides potential buyers. At the same time, though, the company targets first-time buyers with lower-price-point homes. These two things work against each other, as higher levels of customization inevitably mean higher prices. Eventually, either customization or affordability was going to take precedence, and it appears affordability won this round. Reading the tea leaves of KB Home's recent results, investors shouldn't be surprised if we see a couple of quarters with weaker results. The one-two punch of lower net new orders and a rising cancellation rate suggests its backlog will get drawn down faster than others and will start to eat into sales even more. That stands in rather stark contrast with Wall Street's 2019 earnings estimates in the range of $2.41 to $3.30 per share. 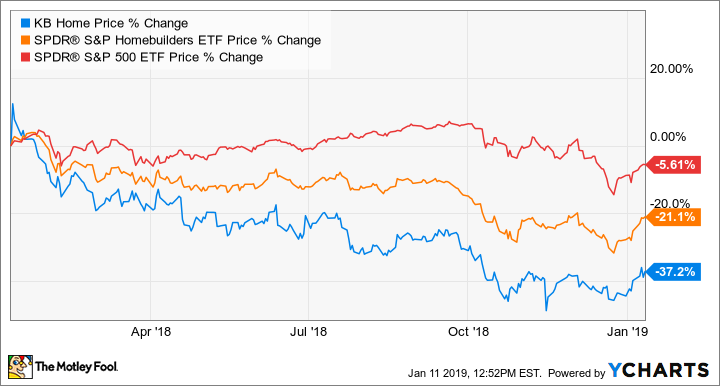 What's even stranger is that KB Home's stock continues to be valued as one of the most expensive in the homebuilder business even though it has continually underperformed its peers in generating returns. Investors looking at this industry should shy away from this stock, because it's hard to see the value you get from its shares right now.